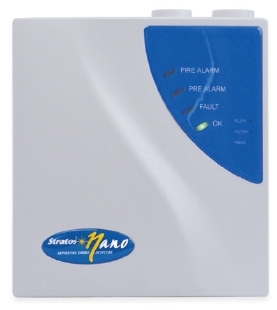 Aspirating smoke detection has been made reliable with the specially designed Kidde Stratos Nano, supplied in a compact and easy to install package. The detector is supplied in a ABS enclosure. An internal DIL switch enables simple on-site programming without the need for a special programmer or laptop PC. ClassiFire Perceptive Artificial Intelligence ensures that the detector operates at optimum sensitivity for the protected environment, without the need for complex setup. This means the product will configure itself to provide high sensitivity in a small comms room or reduced sensitivity in a smoky area. Volt free contacts ensure compatibility with any fire alarm system.